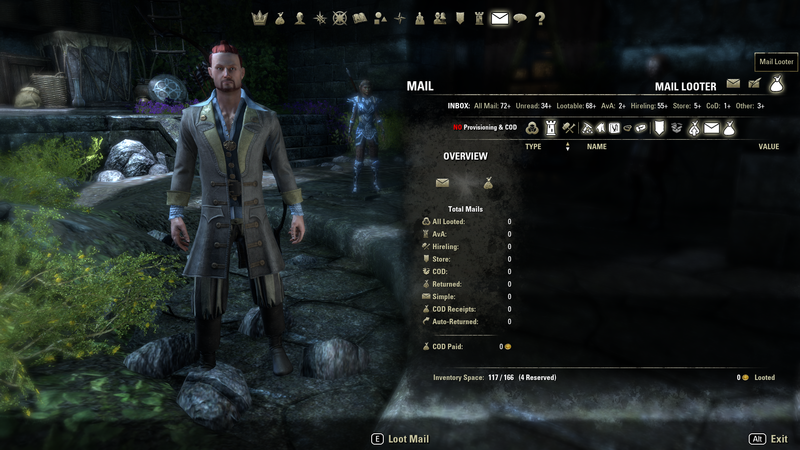 Loot all the mail in your inbox for gold, items, and delete them with just one button press. Guild Store : Loots all guild store mails. Buy, Sold, Canceled, Expired. COD : Accept COD mails and loot. OFF by default. Configurable money limits. Returned : Loots all mail marked as returned. COD Receipts : Loots cash payments from CODs sent. Auto Return : Can auto return mail based on subject keywords. Access the Addon via the new Loot tab on the default mail interface. 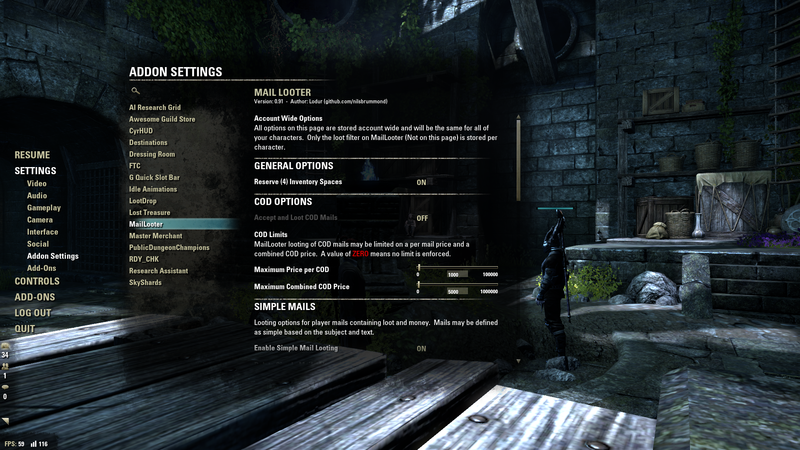 See: 'Settings -> Addon Settings -> MailLooter' for all of the options. This Addon Does Not Work in the New Console Controler Mode. You must switch back to the PC interface to use this addon for the time being. I need to make a whole new UI to support console mode... So will be a while. This addon currently is English only, but I'm happy to accept patches for translations to both officially supported languages and unofficial languages. All strings should be translatable. - Updated RU support from ForgottenLight. - Should now delete already looted mails that match the filters. - Updates for latest ESO API update. - German language translation thanks to DarkRuler2500. - Now will delete all "Champion 160" spam mails when run. - Can now detect, timeout, and recover when the ESO client does not post an async event in response to a mail API request. This should fix the never ending looting without progress. 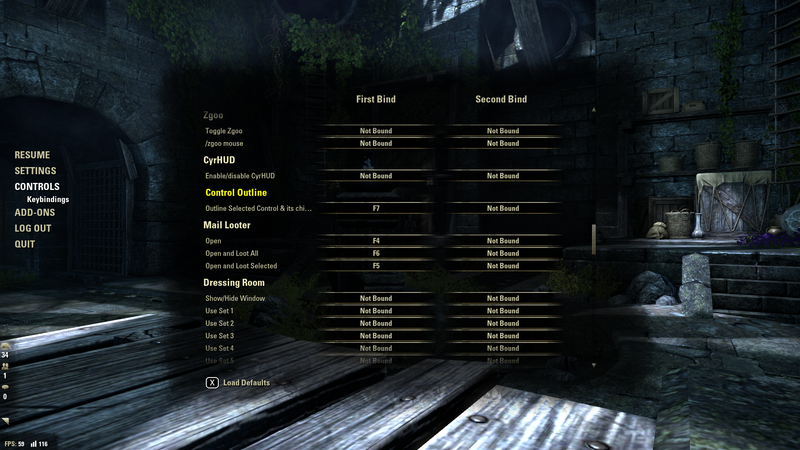 - Installs a (Improved) patch in the ESO UI Mail Inbox to stop crashes there triggered by MailLooter deleting mail. - Installs a patch in the ESO UI Mail Inbox to stop crashes there triggered by MailLooter deleting mail. - Now can configure the reserved space. - Bug fix for unofficial languages support. - It's been stable for a while. Beta is over. 1.0.0 is here. - Support for translations to other languages. Including unoffical languages. - Updated to work in with the 2.2 patch level. - NO Support for Console mode. - Fixed alpha sorting by name when name is NOT the sort category. - Context menu added to loot. - From: line added to COD items. - IsMailReturnable check now used before auto-returning mail. - Guild store mail items are now tagged as 'canceled' and 'expired' in the display. - Fixes for item stacks showing in multiple rows. - Delete simple mail after option should now work. - Added some rate limiting to prevent flooding the server. - filter bar descriptive text now excludes disabled items. - Version 0.90 and we are BETA Now! - Can now filter what is loot. - Add overview showing the number of mails by type looted. - Added looting of player sent mails with no subject/body or configured word count threshold. - Can configure mail auto-returner subject titles to prevent conflicts. - See: Settings -> Addons -> MailLooter. - UI improvements to the looted item list. - auto looting of returned mail. - Will now by default Not accept COD Mail. - Added inventory space display. - Added gold looted display. - First working version of looted item scroll list is in. - Moved access of attached items to after the mail is read. - No visible changes to the user interface. - Much improved handling for reserving 4 inventory spaces for crating deconstructions. - Improved handling of low/no free inventory space situations - Including stacking considerations. - Improved error case handling during mail looting. 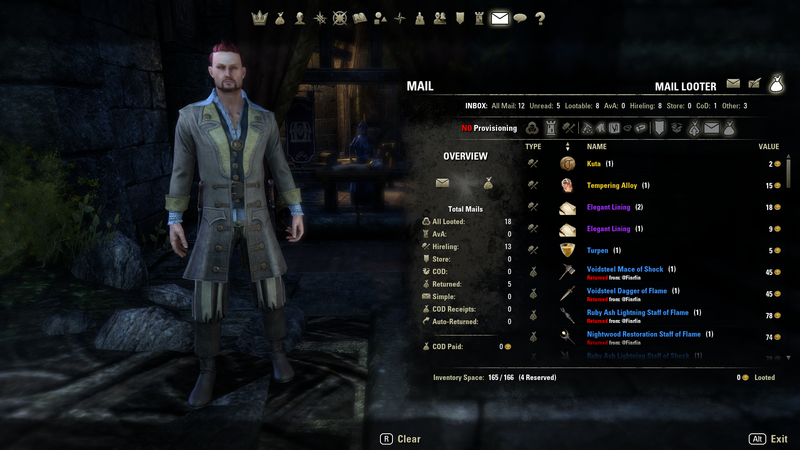 once i open maillooter interface it brokes default mail and i have to reload ui for every single mail like battleground rewards is there a any solution for this? It will now be in a state where the main part of the window is mail looter, but the icons above are of the guild screen (I.e. Home, Roster, Ranks, Hereldry, and History). There is no way to get the mail icons back to check or send mail. I'm seeing that behavior now, but it's my Guild window that is covering up the mail options and I don't use that addon. I use a lot of others though... So not sure what the cause is. Last edited by ninti : 05/26/18 at 05:29 PM. if you use AdvancedAutoLootRenewed its mail tab buttons overlap yours. Last edited by Lakashi : 05/23/18 at 12:13 PM. I get the Timed Out Waiting For Mail error but just ignore it. It gets me the mail anyway. Just seems that error pops up when game is lagging. Note I will not remove anything of great importance from my mailbox with this addon (I would not have even if it was not outdated) cause not taking chances. But petty auction moneys and whatnots I have never lost anything in mail using this. Still works after Morrowind tho I wish someone would update it before it gets discontinued. Great addon should have been a game dynamic by zos. is this addon have same issue as post master? MailLooter version 1.2.2 released at 7,923 downloads. Personally I have never seen it where you get more then one or 2 timeout errors. the number that video shows is just odd. Is it repeatable for you? is errors i posted in the video fixed? Last edited by Lodur : 08/09/16 at 09:33 AM. Hi! The new release (v 1.2.1) has an old version of translation. You forgot to include in the new release of my translation? Also, it would be good to add to the CORE.AddUnofficalLang(lang) function fills an TitlesJunk array with data from MailLooter.unofficalLang.